The 35th theme for #FoodieMonday #bloghop was #NavrathriSpecial. I was in a dilemma as to how I will get this post ready in a day as I was travelling on Sunday. I’ve already posted many fasting recipes. I’m glad this theme was chosen as I’ve learnt something new. Did you know that Navratri is celebrated 5 times in a year? I didn’t know that. The first is Vasanta/Chaitra Navratri (around March or April), Ashad Navratri (around June or July), Sharad Navratri (around Sept or Oct),Pausha Navratri (around Dec or Jan) and Magha Navratri (around Jan or Feb). Our family celebrates the Sharad Navratri. Chaitra Navratri begins on the first day of the Chaitra month(this year 8th April) and ends on Ram Navmi Day. During this period Goddess Durga is worshipped, prayers are offered and people fast. During the fasting period, some take only fruit, milk and water, others fast by eating one meal only and others do not eat any grains or pulses during this time. Goddess Shakti manifests herself in three different forms, Goddess Lakshmi,(wealth), Goddess Saraswati (knowledge) and Goddess Durga(energy). The first three days are dedicated to Goddess Durga, the next three to Goddess Lakshmi and the last three to Goddess Saraswati. If one worships and fasts during this period without any expectation and with dedication, Goddess Durga blesses the devotees with energy and freedom from all bondages. Fasting periods are also good. It helps to rest the digestive system,cleanses and detoxifies the body,promotes mental clarity, helps to break eating patterns(nice way to get rid of bad eating habits), helps you feel light and more energetic and most importantly helps to enhance spiritual connection and inner calmness. It is important to hydrate oneself and eat light. 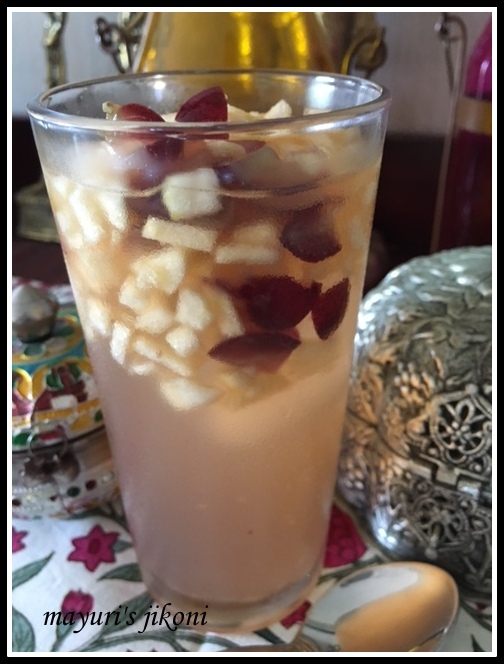 For today’s theme I have made and extremely refreshing, light and energetic drink. Chop the lemongrass into smaller pieces and put them in a pan. Pour the hot water over it. Cover the pan and let it steep for 20-30 minutes. Strain the water to remove the lemongrass. Add lemon juice, honey and the finely chopped fruit to the cool lemongrass water. Mix well and refrigerate till its cold. To serve, add ice cubes to the glass. Pour the fruity tea over it and enjoy. If you are fasting, add rock salt( sendha namak) if you want. Adjust sweetness according to your taste. Lemongrass helps digestion, is good for the skin, soothing when you have a cold or flu,reduces arthritic pain. Healthy and beautiful share Mayuri inspite of your trip! Excellent share Mayuri. Very healthy and refreshing. Refreshing and tasty with the lemon grass and fruits. So much refreshing…A perfect drink for this summer!